Here are the most popular books on unschooling. In Free to Learn, developmental psychologist Peter Gray argues that in order to foster children who will thrive in today’s constantly changing world, we must entrust them to steer their own learning and development. Drawing on evidence from anthropology, psychology, and history, he demonstrates that free play is the primary means by which children learn to control their lives, solve problems, get along with peers, and become emotionally resilient. A brave, counterintuitive proposal for freeing our children from the shackles of the curiosity-killing institution we call school, Free to Learn suggests that it’s time to stop asking what’s wrong with our children, and start asking what’s wrong with the system. It shows how we can act—both as parents and as members of society—to improve children’s lives and to promote their happiness and learning. The Unschooling Unmanual features 11 essays by 8 writers: Nanda Van Gestel, Jan Hunt, Daniel Quinn, Rue Kream, Kim Houssenloge, Earl Stevens, and Mary Van Doren. Through engaging personal stories, examples, and essays, the writers offer inspiration and encouragement for seasoned and prospective unschoolers alike. This book is a collection of writings from different authors — parents and/or educational philosophers — that each illuminate a different facet of the reality of an unschooling lifestyle. I have read the The Unschooling Handbook, which I found to be adequate but simultaneously disquieting (because some of the parents seemed to be so ‘hands-off’ as to be bordering on neglect), and Radical Unschooling, which clarified my own approach to unschooling by demonstrating what I was not comfortable doing (the ‘radical’ portion of Radical Unschooling involves allowing children to make all their own decisions… not just around what they want to learn, but also when they sleep, what they eat, how much and what television they watch, how much and which video games they play… and I think that ventures from ‘unschooling’ into ‘unparenting’). I also read Homeschooling Our Children, Unschooling Ourselves, which I found to be very helpful as one family’s journey into unschooling, however this book offers more and varied experiences. Unschooling, at its best with involved, flexible, interested parents, allows children to grow and develop into their own unique, passionate, entire selves, and this book helps to see how that is possible. A compelling story about one family’s journey into the unknown territory of homeschooling, told with skill by Alison McKee, a gifted teacher with a wide experience in traditional education and a special sensitivity to the individual needs of children. Trusting her own children to “show me the way” was a difficult challenge – but one that gave unexpected and rich rewards. Anyone familiar with the writings of John Holt will be interested to learn how things worked out for a family that decided to test his belief that children are the best directors of their own education. McKee offers the reader insights on how children learn, plenty of illustrations and practical advice about how “unschooling” works, and thoughtful commentary on the state of education today. This book will reassure parents considering homeschooling that nurturing children’s natural desire to learn can empower their children to become enthusiastic life-long learners. The most convincing evangelist is a reformed sinner, and Alison McKee, herself a practicing teacher, comes across as a most credible proponent of homeschooling in this consistently insightful book. No vapid cheerleading here. Like many another anxious parent, McKee and her husband suffer from uncertainties while seeking that elusive balance between structure and free exploration as their two children progress through the elementary and high school years. Readers of this book will come to understand how great a gulf lies between the initial decision to school ones children at home – which for many parents simply replaces one set of rigidities with another – and the real leap off the precipice to unschooling. 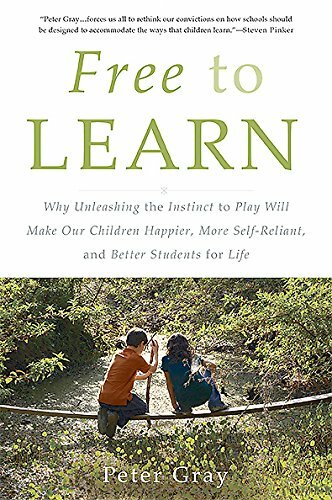 Whether or not one is prepared to go all the way, as McKee ultimately does (with successful results), the book will undoubtedly bring the reader face to face with one of the most fundamental, and generally unasked, questions of education: what (if anything) does what children learn have to do with what they become? This is a great pick-me-up for home-schooling parents, and a thought-provoking explanation for those who seek to understand homeschooling. But anybody who is interested in learning will find grist for her or his own mental mill here. Did you know that a growing percentage of home schoolers are becoming unschoolers? The unschooling movement is founded on the principle that children learn best when they pursue their own natural curiosities and interests. Without bells, schedules, and rules about what to do and when, the knowledge they gain through mindful living and exploration is absorbed more easily and enthusiastically. Learning is a natural, inborn impulse, and the world is rich with lessons to be learned and puzzles to be solved. Successful unschooling parents know how to stimulate and direct their children’s learning impulse. Once you read this book, so will you! If you want some real inspiration about unschooling, or maybe some validation, this is a great book. Griffith speaks eloquently about the power of unschooling. She dives deep down into the political, social, and personal implications of the practice and shares the stories of a handful of successful unschooling families. I think the “handbook” part of the title is earned through the extensive resources she lists at the end of each chapter. If you are worried about math, there is a math chapter. Science? See the chapter. Want games, puzzles, workbooks, videos? It is all in there. But the bulk of each chapter is filled with Griffith’s passionate explanation and defense of homeschooling. Having opted out of formal education, Hewitt’s sons learn through self-directed play, exploration, and experimentation on their farm, in the woods, and (reluctantly) indoors. This approach has allowed the boys to develop confidence, resourcefulness, and creativity. They learn, they play, they read, they test boundaries, they challenge themselves, they fail, they recover. And these freedoms allow their innate personalities to flourish, further fueling growth and exploration. Living in tune with the natural world teaches us to reclaim our passion, curiosity, and connectivity. Hewitt shows us how small, mindful decisions about day-to-day life can lead to greater awareness of the world in your backyard and beyond. We are inspired to ask: What is the true meaning of “home” when the place a family lives is school, school system, and curriculum? When the parent is also the teacher, how do parenting decisions affect a child’s learning? (And exactly how much trouble can a couple of curious boys gallivanting in the wild woods all day get into?) Home Grown reminds us that learning at any age is a lifelong process, and the best “education” is never confined to a classroom. These essays on nature, parenting, and education show us that big change can come from making small changes in how you live on the land, while building a life you love. Lace up your boots, grab a stick, and come explore the New England woods with author Ben Hewitt and his sons, Fin and Rye. Amongst the tall trees, small animals, and rich earth, you’ll find the children’s schoolhouse. But it’s not an actual building, it’s a natural workshop encompassing the surrounding area where the boys plunge, examine, dig, construct – and most importantly – explore the physical world around them. Through their daily journeys, the students have learned the lessons that THEY need to learn; their curriculum being entirely self-devised. From their own efforts, the boys have succeeded in being schooled by being unschooled. Hewitt poetically describes the transformation in an engaging story that transports you deep into the forest to a place where you may not want to leave. You’ll realize you’ve been here before, a long time ago, when you’ll recall the beauty and wonder of your own childhood mind. But Hewitt’s boys can revel in their curosity here, unchecked by teacher or parent. Through their discoveries in the forest, they’ve found their own path and are designing their own trail. With confidence and vigor they forge ahead, while the reader is left to pause and ponder. By the end of this colorful tribute to childhood and to his sons, Hewitt will leave you NOT where you began. It will be up to you whether you decide to go or stay. Whichever course you choose, you will revisit your own journey and find the crystals of knowledge you left there long ago. And you will find the truth that you knew the answers all along. “While most schools continue to resist change, homeschooling families have abandoned the K-12 system and identified new, powerful, commonsense methods and goals for childhood education. Education expert Clark Aldrich has explored the practices of homeschoolers and unschoolers (those who eschew the structure or curricula of schools) and distilled a list of 55 “rules,” like the following, that are changing both the way children are taught and our vision for schools. – Learn to be; learn to do; learn to know. – Tests don’t work. Get over it. Move on. – What a person learns in a classroom is how to be a person in a classroom. – Animals are better than books about animals. – Internships, apprenticeships, and interesting jobs beat term papers, textbooks, and tests. – The only sustainable answer to the global education challenge is a diversity of approaches. This accessible book provides you with a path forward, whether you’re a parent or teacher, a school administrator, or a national policy decision maker. This expansive and intelligent look at the concept of “”unschooling”” is not only as penetrating an exposition of “”what’s wrong with schools”” as I’ve seen but also gives the reader what I think is a very useful insight into the appeal of unschooling, why it’s booming and why, to borrow an opinion from elsewhere, “”it’s not just for hippies””. Whatever our ‘love affair’ with the school classroom might have been in the past (I have a grown up daughter who was very successful in school throughout the 1990s), I live now in a culture of unprecedented educational opportunity, a reality where every self-motivated individual with an internet connection is free to learn whatever they choose to learn whenever and wherever it suits them. It’s the age of the “”digital revolution”” – and that has made schools the laggards of the education world and in need of the kinds of fundamental changes that Clark Aldrich explores through his ideas, often with the help of some wry and perceptive humour. If you’re eager to share the wonders of life in the real world with your children, to help them explore a world larger and more exciting than school’s four walls and rigid programs can offer, let me share my unschooling experience with you. Thinking about homeschooling? Curious about unschooling? Walk with me as I share the five paradigm-changing ideas about learning and living that freed my family from the school schedule. With over ten years of experience, I have come to see how key these ideas were, and still are, to our unschooling lives. With stories, examples, and clear language, Free to Learn explores the depth and potential of unschooling. Learning freely, living joyfully. I love this book. I have owned it since 2012, and I often lend it out to others. From Pam’s introduction, when she shares how she tried to help the schools work with her oldest son’s uniqueness, through the five ideas that are key to real learning and living together, Pam writes clearly, intelligently, concisely, with a natural friendliness and a joyful outlook. On one hand, Pam makes it sound as simple as it really is: you and your children can be happy and learning without school. And yet, because unschooling does require questioning the mainstream, Pam gives you robust tools for asking those questions and seeking answers that ring true. I would recommend this book, not just to those interested in unschooling, but for anyone who has questioned formal education and how children learn best. Summary of Sandra Dodd’s website on unschooling and mindful parenting, with hundreds of practical ideas about how to move from schoolish thinking to living a life of natural learning and joy. “Take no prisoners” is what my dad used to say when he wanted to encourage me to give something my all, to apologize for nothing, to really go for it. I imagine that’s what he’d say about Sandra Dodd’s writing style. She has something to say about which she is passionate, in which she is experienced, and to which she is dedicated, and she bloody well says it. A “best-of” of her large and sometimes unwieldy website, this thick tome is essentially a collection of years of the author ranting and raving in her own special way on a variety of related topics under the radical unschooling umbrella. Unquestionably qualified, as a parent of 3 now grown unschooled children and a radical unschooling rabble-rouser for decades, Sandra Dodd implores, beseeches, commands, and invites parents to open our eyes to a new way of living and parenting, based on the radical notion that children are (gasp!) full people, and furthermore on the idea that we learn all the time. Shocking, i know, but true. She does hit a few flat notes here, like her idea that conventional candy is ok for kids’ developing bodies, or that television is just fine for growing brains, or that primitive indigenous tribes did not unschool. This comes from what i see as a subtle disdain for research – as part of academia. And where has academia gotten us? she seems to be asking. Certainly it hasn’t created generations of happy, respectful young adults! Anecdotal evidence is fine, and we all know that statistics can be damn lies, but without the ability to think critically we can fall on our faces, and she does, in my opinion, occasionally fall on her face. A risk she is clearly willing to take in unapologetically trying to get us to hear her so that our children will not be subjected to the soul-killing controlling behavior and manipulation that most of us think we’re supposed to undertake. But if anything, her mis-steps only add to the whole experience that is this book. It is a wild ride. Without her unbridled, opinionated approach, heedless of the poor opinions of others, she would not be able to get to the heart of the matter. Which indeed she does. In telling us to stop controlling our children, she is asking us to give up a fundamental lynchpin of our identities, and enter into a partnership with our children in which we treat them with true respect. And it leads to joy. This is her (i think, well proven) thesis. And it *is* truly radical. And that’s really the heart of the matter. And maybe giving up restrictions on our little beings is worth letting them enjoy some red dye #3 when they choose to. I’ve certainly decided so. Unschooling means so much more than a hands-on, child-directed, and experience-based way of learning. It doesn’t describe a specific alternative to schooling. It just gets schooling out of the way so various unique dynamic personal creative ways of growing up, living, participating, and contributing to communities can develop. When I say “unschooling,” I really mean living cooperatively with children. What began as a way to approach my children’s learning/education has evolved into a whole lifestyle characterized by unlimited creative possibilities for our whole family. In other words, we perceive our life as a creative adventure. We’re all in it together. In “The Unschooling Happiness Project,” I present my family life as a creative project, share my deeper motivations behind choosing the unschooling lifestyle, and include some practicalities of daily unschooling life. Radical Unschooling is a progressive parenting philosophy, which includes children learning at home. It is different from homeschooling in that children are not forced to follow curriculum lessons and tests. Radical Unschooling philosophy focuses on trust of a child’s innate ability to learn without coercion and invites children to explore their passions. The parent’s role is to facilitate their interests and curiosity. Radical Unschooling – the book – focuses also on the evolutionary aspect of parenting and human consciousness. We are parenting and educating our children today to succeed in a joyful, productive life by following their passions, not someone else’s agenda. This is a great book, with lots of thought provoking topics. My only criticism is that it could have been a little longer. It contains a lot of information that is already on Dayna’s blog, and the spacing of text, while easy to read, spreads out the information even more. If you are at all interested in unschooling, then this book is a must buy. Just don’t expect a tome. What does unschooling look like day-to-day? Want to help it take root and blossom in your family? There are a number of characteristics that allow learning to flourish, and in Free to Live I discuss the four that have had the most positive impact on our unschooling lifestyle. Understanding why these characteristics are so helpful makes it easier for parents to choose to respond in ways that support unschooling, rather than undermine it. “Are schools social levelers or do they reinforce the class pyramid by tracking and sorting children from a young age?” asks Astra Taylor in this single from n+1 (Issue 13). In her answer, Taylor blends memoir and educational history in a broad-reaching examination of unusual alternatives to mainstream education in the United States. I am sick to death of the curriculum wars. Public education is a political football in my country. Astra offers an insight into what is possible if children are allowed to just learn. One of the great failings of schooling is that children are expected to be good at everything, whereas as adults they can be specialists. In my multi-level classroom we don’t worry about grade levels too much just what’s interesting. I thought I was a bit radical but Astra suggests I have not yet gone far enough. All children are born to learn and their learning is as natural as breathing. In fact, children are learning all of the time. With the advent of the internet and so many parents working from home, it’s time to bring the children back home too. Learning happens inside and out, in social groups of all ages and as they venture out into the world. This slim book discusses unschooling from the perspective of a veteran homeschooler turned unschooler and parenting expert. I would thoroughly recommend Kytka Hilmar-Jezek’s Born to Learn to any parent; ones starting their journey into education, or those further along the line who feel there is ‘something missing’ in the way modern systems approach structured learning. Jezek draws from the Unschooling/Home Education giants from John Taylor Gatto and John Holt to the Buddha, and presents a cohesive introduction to these thought leaders’ views in an approachable and understandable way. Having raised three children in this paradigm, she introduces why a formal school environment might not be the best environment to raise entrepreneurs and free thinkers of our future generation. I wholeheartedly recommend Born to Learn; it is full of inspirational quotes and anecdotes of free, passion-led learning and spiritual guidance, to inspire, supplement and support your journey into whole life learning (not just between the arbitrary ages of compulsory education; the term itself an anathema to the ongoing pursuit of human potential). Humans are natural learners. Many of the authors in this collection of essays begin from a learner-centered, democratic perspective. Kate Fridkis, Eli Gerzon, Candra Kennedy, Jessica Claire Barker, Peter Kowalke, Idzie Desmarais, Sean Ritchey, Brenna McBroom, Andrew Gilpin. Divided into three sections, the first part of the book deals with what constitutes a learner-centered approach to education. The second section addresses how some have implemented this approach. In the last section, learners who have lived learner-centred learning share narratives about their experiences. Ever considered taking your child’s education out of the government’s hands and into your own? How about their own hands? This book is a compilation of essays written by education experts, home/unschooling parents, leadership in the unschooling community, and grown unschoolers. It is a refreshing wealth of perspectives on giving your child the ability to learn naturally and how, despite all the misgivings you might have on a regular basis, chances are your child will turn out just fine. I’m giving it five stars because that’s what it deserves. Everyone should read this book!! In the absence of school, what do children do? They play. They do what brings them joy. They do what they need to do to get from point A to point B, learning useful skills along the way. This is a practical handbook on learning without school. It’s about the hows as well as the whys of unschooling. You’ll find out how unschoolers learn “the basics” and how they meet legal requirements without sacrificing their ideals. The unschooling approach to life, in general, describes the way we learn naturally when left to pursue our own personal interests. As unschoolers, we own our interests-our passions, dreams, and goals-and also the responsibility for pursuing and attaining them. We respond to our desires and go after our dreams with enthusiasm. Unschooling parents and their children live and learn together, helping each other, making discoveries, solving mysteries, and sharing adventures. Ready to have some fun? Sara McGrath presents a practical guide for parents to follow when choosing the ‘unschooling natural learning’ method for their children. She covers everything–from suggestions as to how to overcome initial fears and doubts to recordkeeping and meeting the educational legal requirements of your state. She also includes a multitude of ‘unschooling’ and homeschool resources for parents as well. This book is definitely a must in every homeschool family’s bookshelf–whether you opt to ‘unschool’ or homeschool, the information McGrath offers is extremely valuable–a wonderful book! Finally, a Christian homeschooling book that allows you to think outside the box. Christian Unschooling: Growing Your Children in the Freedom of Christ utilizes the essays of Christian, unschooling parents from across the United States and Canada to reveal a new way of homeschooling-one that is respectful of the child, the parents and the way God created children to be. Packed with information such as the benefits of unschooling, how to ease into the process and keeping records of your unschool, this book offers encouragement to parents who feel that God might be leading them down a different path. I was excited to read this newly released book and hungrily gobbled up the contents in the first couple of days I had it home. It was affirming to read about others’ stories much like our own. It validated the way we’ve been led by the Lord to raise and educate our own children! The book was very easy to read and full of material that, in its familiarity, was comforting and built my confidence. Reading the essays sent in by others was like sitting around sharing our experiences, struggles and triumphs from the heart. My favorite section of the book was the one entitled “Guided by the Lord”. In it, a couple of stories gripped my heart and brought both encouragement and inspiration. In my opinion, it is a “must read” for those looking into homeschooling and as well, those who are searching for a more relaxed and enjoyable way to homeschool their children. Full of brilliant common sense! Mrs. Martin takes us behind the curtain to see in rich detail what alternative education really looks like when it bestows upon its subjects the freedom to choose. Every parent who feels compelled to give their kids into the care of total strangers should read this book. –John Taylor Gatto, Author: Dumbing Us Down And Weapons of Mass Instruction. Radical Unschooling is a progressive parenting philosophy, which includes children learning at home. It is different from homeschooling in that children are not forced to follow curriculum lessons and tests. Radical Unschooling philosophy focuses on trust of a child’s innate ability to learn without coercion and invites children to explore their passions. The parent’s role is to facilitate their interests and curiosity. Radical Unschooling – the book – focuses also on the evolutionary aspect of parenting and human consciousness. We are parenting and educating our children today to succeed in a joyful, productive life by following their passions, not someone else’s agenda. The main presentations are – School is only one of many choices for our children in our technologically advanced world. – Forced learning isn’t effective and causes more damage than formerly thought. – Respecting a child’s choice and autonomy is an evolution of understanding and birth right of every human. – Learning and life are not separate. Learning is pleasurable if it is not forced on us. – Separating life into subjects isn’t necessary or natural. – Humans learn from all that they do and experience in life, not just what our culture deems ”educational.” – The main focus of parenting today is obedience and meeting the needs of the parent. This has to change if we want our children to live in a peaceful world. Moreover, Radical Unschooling is just radical enough to herald a wake up call to our culture because of the truth the philosophy speaks. This is one of the best books i have read in a while. Not only a book about Unschooling but a book about parenting and how to relate to one another in a loving way. This book i feel outlines a blueprint for a new way forward for humanity.I would recommed this book to everyone to read, and a must read for parents that know there is another way of relating to their children that involves love trust and mutual respect. Thank you Dayna Martin for this wonderful contribution to humanity. Suzie Andres explores the basic premise of the household as the primary place of education and the role of parents as primary educators. The book will be engaging and helpful regardless of the method of education selected by parents—homeschooling, unschooling, or public and private schooling. Whether you are a homeschooling parent or simply a parent concerned with the quality of your children’s faith formation and education, you owe it to yourself and your family to learn a bit about the concept of “unschooling”. In her new book Homeschooling with Gentleness: A Catholic Discovers Unschooling (Christendom Press, October 1004, paperback, 132 pages) takes a look at this “gentle” variation to the traditional homeschooling path. As a mother of two Catholic school students, I must admit that I initially approached Andres’ book from a perspective of suspicion. My reading of this book, however, produced much fruit in the form of an enhanced appreciation for my own role, and especially that of my children themselves, in their own educations. In his comments on the book, noted author and professor Ralph McInerny reminds us that “The Church has always insisted that the parents are the primary educators of their children.” Far from being critical of formal education, Andres book is a positive and uplifting commentary on the concept of “unschooling” and shares ideas and suggestions that will be of value to any family, regardless of your educational preferences. What does day-to-day life look like for an unschooling family? Pam Laricchia has been unschooling her three children for over a decade. Life Through the Lens of Unschooling, like day-to-day life, meanders here and there, covering a wide array of topics. You’ll find essays tackling everything from learning to read to visiting relatives, all organized around nine key words that have been woven into the fabric of their unschooling lives: deschooling, learning, days, parenting, relationships, family, lifestyle, unconventional, and perspective. The theme is life; the lens–unschooling. Drawn from her popular blog at livingjoyfully.ca, imagine this book accompanying you, a joyful companion on your unschooling journey, as you dig deeper into your understanding of unschooling and what it might look like day-to-day in your family. Well written and clear, this illustrates the practice and effectiveness of unschooling beautifully. If you’re an unschooling parent looking for inspiration and encouragement, or trying to find a way of articulating what you do, this book and the author’s other books ‘Free to Learn’ and ‘Free to Live’ are exactly what you’re looking for. Rather than a long, drawn-out book about the ups and downs of homeschooling, this short account of what works well for Kelly and her family of very bright girls will have you feeling positive about making use of every day situations, events and experiences and turning them into learning opportunities. This was a very inspiring read, and offers just the sort of reassurance I need to create a successful, yet flexible teaching schedule for my son. How do we learn best? The willed curriculum is not an unusual event but is something that we experience on a daily basis. It is not a deviation from many everyday routines but, in fact, it is a process that happens many, many times a day, day in and day out, to all of us. It is not something unusual or strange, but if we pay attention to how we live our lives we will quickly realize that we are making use of the willed curriculum already, and often with powerful and dramatic learning results. In this sense, the willed curriculum is not a call for something new but a call to be more mindful and make more use of something we are already using. We know that interest and internal motivation are critical for deep learning. Loving what we are learning, interest, and internal motivation are at the very core of the willed curriculum. The author challenges the traditional idea that the best learning has to take place at school, in a class, with student of your age, and that it must cover only subjects that are imposed and tested by a third party. the best way of learning is to learn what we are deeply interested in, and by forcing learning on others we curb their future interest in real learning and education, not to mention the damage we do to their personality. Excellent starting point for a discussion and a must read for parents and teachers alike. People ask me a lot of blunt questions about unschooling. That’s okay with me. It’s why I put myself out there as an advocate. I’m not particularly interested in putting down schooling (or conventional parenting in general), although I certainly could as this provides a starting point for some people to take a closer look at children’s experiences. However, I’m more interested in sharing the lifestyle that my children and I love. I want people to grow up feeling free and empowered, happy and enthusiastic about their lives, confident, self-assured, and open to unlimited possibilities. I start with my family’s experiences and share what we’ve learned so far. Our children are our best teachers and our hope for a learning and growing world. Children are precious. They remind us of what really matters and help us see past what doesn’t. Our job is to love, support, and guide our children as they live their own lives. I want our children to dream big and believe in themselves far beyond the limitations of a schooling program. Read this book. We’ve unschooled for years, and this is a great overview. Its short, packed with examples, and you’ll finish with several resources to keep you learning. She had me when she began with a definition. Homeschool is organic and always changing to fit the family doing it. Sara explains that beautifly. If you think unschool means no parental involvement, think again and give it a chance. Even if you choose not to unschool, this book will influence what you think about education. By conventional measurements, my unschooling daughter ranks at least two grade levels ahead of her schooled peers. How did she accomplish that without school lessons? This question was my inspiration for this book about my family’s approach to learning. Unschoolers are on to something. Find out what. An inspiring, upbeat volume: traces the author’s development toward a sustainable lifestyle (total utilities in a 2,103-sq.ft. house with no solar equal $72.58/month), beginning with early… More > self-propelled UnSchooling and ReSkilling methods; includes proactive steps toward individual self-empowerment in the Transition Movement, PermaCulture and ReSKILLING communities. There were a few repeats of text, in one case an entire two pages repeated, and several other “rough” edges. There are many quotes from John Taylor Gatto’s “Dumbing Us Down,” which is a fantastic book. That said, I was really expecting this book to be what its title implies: a “Primer.” It is not that. It is very short (as mentioned) and has no actual instruction, aside from the very beneficial advise to “kill your television” (I have lived without television for 17 years, and before that I rarely viewed it, so I am a very biased “down with the tv” type anyway). It was a fun read, however, with some neat quotes and many anecdotes regarding the author’s life. Not until you actually teach can you know if you’ve chosen the right occupation. All the books, theories, and classes on education fail to adequately prepare you for that critical moment when you stand before those students and attempt to win them over. This is a story of a young woman’s struggle to do just that. She soon learns what teaching really entails. Her mentor and resource teacher, John Cordray, leads her on a journey of understanding, uncovering the true meaning of education. She will come to know the real purpose behind testing and grades, discipline and rewards. Cordray educates Kelly by uneducating her, and in so doing, she will come to realize what education really means. Kelly’s story demystifies the school system, unearthing the true intent behind testing and learning. It is a story that takes you into the world of education, revealing what can happen to even the most veteran teachers. Just when it appears that all is lost, new possibilities emerge that will force Kelly’s hand. In simple terms and plain language, John McEwan manages to demystify the school system and desconstruct the myths and fabrications that surround the real story and true intent behind the methodologies and practices of both public and private schools. This is not an easy thing to accomplish in a work of fiction, but McEwan pulls it off without sounding preachy or pushy. This was a pleasant and quick read. It was certainly missing some elements of dialogue and debate that would have added dimension to the story, but this may just as well have been the author’s intention to leave the reader plenty of room to formulate their own ideas and make their own decisions on the matter. Most unschoolers, homeschoolers, and democratic schoolers will not gain much new knowledge from this – we are generally able to recall this information in our sleep. But, it does have entertainment value and would serve as a ‘non-threatening’ introduction/ice breaker for discussion on these issues with friends and family. An unschooling book for those just beginning or thinking about it. For the more experienced unschooler, ways of harmoniously blending each members unique interests to that of the family as a whole. Sick of school? Sick of teachers? Sick of rules? Fortunately, we have an alternative, not a stupid brain dead alternative, but something that rocks! Indeed, our alternative, unschooling, rocks like nothing else! You can use freedom of speech for many purposes, so what should we use it for? Why not use freedom of speech to advance the great unschooling and deschooling movement? The future of America calls us to do just that; let’s answer the call. A “normal” American family decides that normal just isn’t cutting it anymore. They start doing crazy things like visiting 52 zoos in 52 weeks, taking a 5-week trip to Cambodia, quitting school, and going down this crazy path called unschooling. They decided to take the road less traveled, and it has made all the difference. Marla does well to put the reader at ease regardless of their educational preferences and then shares her family’s freeing journey with unschooling. As a former public school teacher and a current parent of young kids, this was an insightful look for me into a world of education I hadn’t yet dreamed about. Are you thinking about unschooling your kids? Or you’re still hesitating? Do you want to know what unschooling is? And how to unschool your kids? There’s nothing I get asked about more as a parent than unschooling, and nothing I recommend more to other parents. In unschooling, life itself is learning. There is no “doing school” … you are learning all the time. That’s why my wife and I unschool four of our kids, and have been for several years. Why you should unschool your kids? Are you considering homeschooling or unschooling? Are you unsure what these terms even mean — or what it would be like, day to day? Do you *want* to homeschool, but aren’t sure when or where to begin? Unschooling From Birth Through Early Elementary is your guide. In the introduction, we’ll walk you through what “unschooling” means. (It’s not all radical!) Plus, it’s entirely possible to unschool for the early years, and still choose a different educational path when your child reaches school age. It’s not either/or. The nitty gritty: Early childhood is broken down by age — 0 to 2 years, 2 to 4 years, 4 to 6 years, and 6 years and beyond. For each age, there’s a guide to what developmental milestones you can expect your child to meet, and how to best stimulate their learning. Each age comes with an activity suggestion guide, plus a list of materials. Throughout the chapters, you’ll find some information and advice from a mom of five who’s been there — her kids range in age from 7 to “coming this summer” and she’s walked through this early unschooling journey with all of them. Not sure if you want to homeschool — or know you won’t, but want to supplement your child’s education at home? The activity suggestions are valuable for you, too. It’s not an all-or-nothing approach. These are great ways to teach your child, enjoy your child, and engage your child no matter what you choose for “school.” Any child can benefit from an involved parent! Unschooling sisters Lily and Kate, along with their parents, had plans to go on a family bike ride. When a rainstorm hits, they decide to change their plans into a day at home. As a family they discover just how much fun rain can be! From sandcastles and bubble blowing to pizza and a movie, this family finds unexpected ways to make the most out of the wet, stormy day. See how much fun Lily and Kate have with their parents on their bubbles and puddles adventure! Our public schools are falling apart! Some people despair! But don’t you despair as we do have reason for hope! The framers and maintainers of our public schools seriously messed things up, but we offer good news. The liberating alternatives of unschooling, deschooling, homeschooling, and free schools can change everything. Unlike the public schools, these alternatives offer realistic yet optimistic and empowering views of human nature, which can enable all of us to achieve our full potential. If we implement unschooling, deschooling, homeschooling, and free schools, humanity can soar to all new heights. In highly enthusiastic rhetoric, this book of poems praises these edifying educational alternatives and encourages you to embrace them.